A population of endangered giant tortoises, which once dwindled to just over a dozen, has recovered on the Galapagos island of Española, a finding described as "a true story of success and hope in conservation" by the ESF professor who is the lead author of a study published today (Oct. 28). "The global population was down to just 15 tortoises by the 1960s. Now there are some 1,000 tortoises breeding on their own. The population is secure. It's a rare example of how biologists and managers can collaborate to recover a species from the brink of extinction, " said James P. Gibbs, a professor of vertebrate conservation biology at ESF and lead author of the paper published in the journal "PLOS ONE." 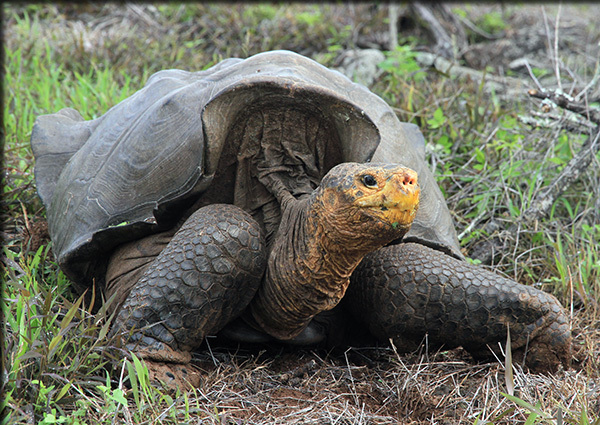 Gibbs and his collaborators assessed the tortoise population using 40 years of data from tortoises marked and recaptured repeatedly for measurement and monitoring by members of the Galapagos National Park Service, Charles Darwin Foundation, and visiting scientists. "Population restoration is one thing but ecological restoration is going to take a lot longer," he said. After the goats devoured all the grassy vegetation and were subsequently removed from the island, more shrubs and small trees have grown on Española. This hinders both the growth of cactus, which is a vital piece of a tortoise's diet, and the tortoises' movement. Chemical analysis of the soil, done by Dr. Mark Teece, an ESF chemistry professor, shows there has been a pronounced shift from grasses to woody plants on the island in the last 100 years. Gibbs' co-authors on the study are Elizabeth A. Hunter, an ESF alumna who is now a Ph.D. student at the University of Georgia; Kevin T. Shoemaker, an ESF alumnus who is now a research scientist at SUNY's Stony Brook University; Washington H. Tapia formerly of the Galapagos National Park Service; and Linda J. Cayot of the Galapagos Conservancy. The research was supported by the Galapagos National Park Service, the Galapagos Conservancy, the Prometeo Program of Ecuador's National Secretariat for Higher Education, Science, Technology and Innovation, and the U.S. National Science Foundation.